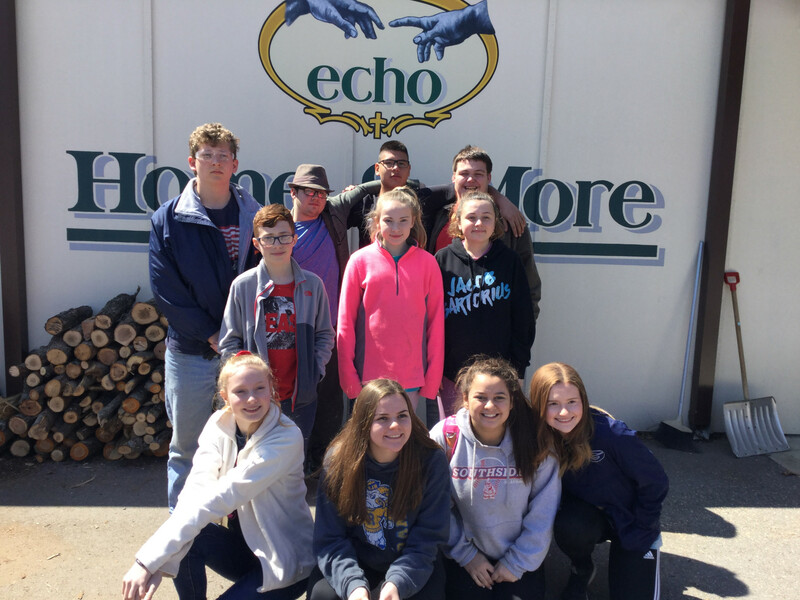 Youth from Grace Community Church in Fort Smith serve at ECHO Village. 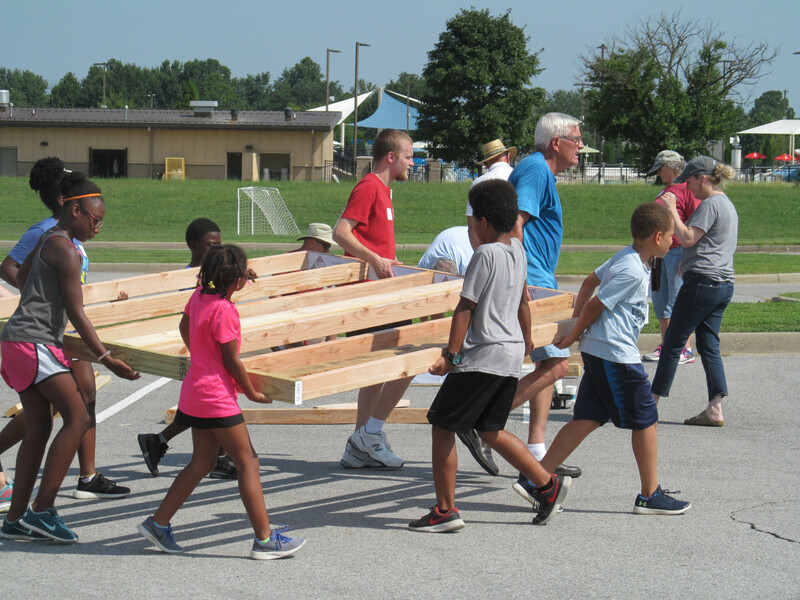 Children and Youth serve in Disaster Recovery building walls that will become a replacement home after the April 2018 Crawford County Tornado. There are many opportunities for children and youth to be involved in mission. Our hope is that churches and those involved in children’s and youth ministry are providing ample opportunity for participation in mission and outreach. Whether serving in Mission or Disaster Response, youth and children follow the guidelines normally required for any event or trip. Parents sign a specific form giving permission for their child to participate in Mission or Disaster Response. Some forms may require a notary. UMCOR guidelines require those responding to disaster in the Relief Phase be 18 years of age or older. This is due to extreme conditions and emotional and safety concerns for youth and children as well as survivors. Good ways for children and youth to help is collecting supplies for and assembling relief kits, praying for disaster survivors and responders, helping to prepare themselves and their family for disaster, raising relief and recovery funds. Disaster Response is very fluid and things change rapidly. All participants must know to be flexible and follow the guidance of those leading the response, both voluntary and governmental. Children responding to disaster in the Recovery Phase should be accompanied by a parent or guardian. Youth responding to disaster in the Recovery Phase should be part of a team. Adult guidance and supervision is required according to youth ministry guidelines and appropriate to job assignments. There are some places youth can serve in response to disaster during the Relief Phase. This should always be coordinated through the Conference Disaster Response Coordinator. The coordinator will know the current status of the response and whether there are opportunities to serve. Responding may involve serving with partner organizations and agencies as arranged by the coordinator. Destination: Mission seeks to provide a mission experience for older elementary and middle school students within the Arkansas United Methodist Annual Conference. Students and adult chaperones come from churches around Arkansas and beyond to experience missions. Students are challenged to see the things that break the heart of God and to seek a call into ministry. Previous participants have gone on to serve in their local communities, seek out mission opportunities as teens, and focus their life on service. Once people arrive on the trip they are divided into teams and work with other participants. Destination: Mission partner with agencies and ministries such a food pantries, thrift stores, and animal shelters to help where needed. In that past they have sorted canned goods, dusted shelves, played games an assisted living facility, washed windows, raked leaves, and anyway possible to serve. Trips are 4 days and 3 nights and take place during spring break and at least one week in the summer. Spring Break 2019 is at First UMC Harrison March 20-23. Registration information at facebook.com/destination.mission. For information, contact Denni Palmer at denni.palmer@arumc.org.